This chapter examines the construction of serious game genre frameworks from a rhetorical perspective. The author argues that to understand the forms of persuasion, learning, and social action that serious games facilitate, perspectives on genre must be developed and applied that situate serious gaming activity within larger systems of discourse, meaning-making, and text circulation. The current disconnect between popular understandings of serious game genres and those expressed by serious game developers represents one instance where rhetorical genre studies can be applied to generate knowledge about the “genre work” that serious games perform. Advocating a notion of genre that seeks to identify forms of social action and the persuasive possibility spaces of gaming, the author concludes by synthesizing digital game-based formulations of genre with perspectives from rhetorical theory to suggest implications for serious game research and design. Given the purpose of this collection—to examine trends related to serious games/gaming from a variety of disciplines and place them in dialogue with each other—I begin with the question of what affordances might be gained from using rhetoric to study serious games. At a general level, rhetoric seems like a perfectly suitable set of ideas to bring in for the study of serious games, especially for the kinds of serious games that are specifically designed for persuasive purposes. I use “rhetoric” here to foreground the persuasive and symbolic potentials of discourse, design, and human expression, carried out not only through language but through the construction of material objects and even computational processes, as argued by Bogost (2007). A common working definition of a serious game, as presented by Michael and Chen (2006), for instance, is a game that does not have entertainment as the primary purpose. This distinction in purpose, which is recognized by both designers and players in a conscious way, is the exact kind of situation that rhetoric is concerned with examining, as it involves a specific communicative “move” that intersects with issues of audience and genre. 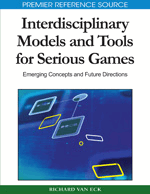 As a discipline, rhetoric is often itself conceived as interdisciplinary or metadisciplinary space (e.g., Vitanza, 1987), making it a productive starting place to construct a cross-disciplinary dialogue about the persuasive potential of serious games. Of course, rhetoric can also be brought in as a way of assessing how serious games that claim to be designed for persuasion actually carry out that purpose. Serious games falling under this category would include games designed for political or social change, environmental awareness, advertising, and so on. Although approaching these games using a rhetorical framework would not attempt to measure the persuasive outcome in terms of audience effects, as in particular forms of communications and social psychology research, it would be useful in assessing what strategies of language, representation, and meaning-making are at work in persuasive games. Additionally, subsets of rhetoric such as visual and digital rhetoric are especially relevant to the study of serious games because games as artifacts rely on visual and digital aspects of composition as an essential component of meaning-making. In this sense, rhetoric can be used to critically examine how serious game elements like interface design are themselves persuasive texts and cannot automatically be read as “neutral” or only in instrumental terms. Reading serious games rhetorically would also mean that games are placed within a larger system of texts, references, and circulation. Rather than existing as standalone persuasive artifacts, a rhetorical approach to serious games calls for a contextualization of serious games as existing within a broader system of discourse. In this chapter, I begin with a brief literature review that examines how digital games, and serious games more specifically where applicable, have been taken up in the literature on rhetoric. I employ the term “rhetorical studies” for this review to emphasize that it is critical to push beyond the boundaries of the field of rhetoric and composition to look for literature exercising rhetorical approaches to gaming, even if the conventional venues within rhetoric and composition serve as the logical starting points. I then shift to the main topic of analysis in this chapter, which is a critique of serious game genres from a rhetorical perspective.